Thank you so much to Cully and Owen at Nomas* Projects, firstly for asking me to show in their windows on Ward Street (Dundee) and secondly for being so open minded. I couldn’t have asked for a better reception. Special thanks to Aki who held up his phone to the window with the unforgettable message “lower the monkey”. That made my day. Nomas is the only 24hour Gallery in Dundee. This show is better viewed drunk. Nomas* Projects asked me to ‘consider Christmas and the contrasts between its original meaning and what it signifies today’. 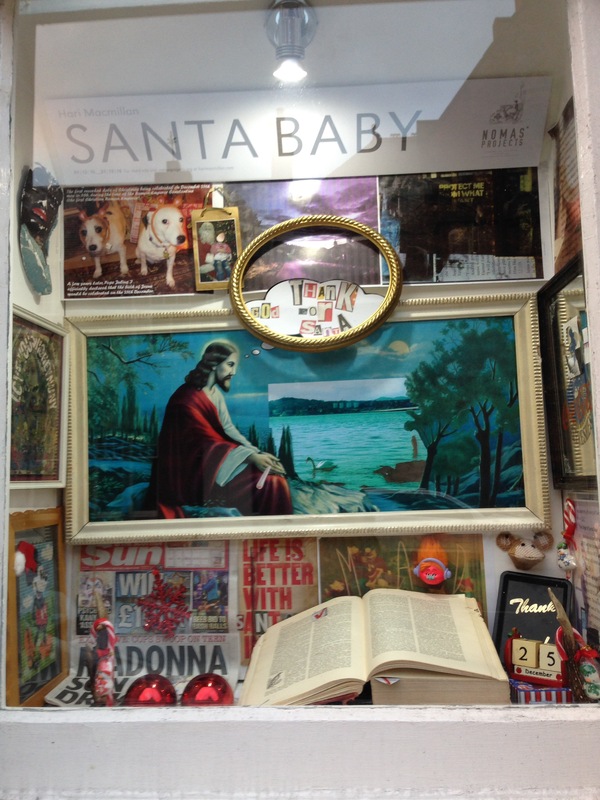 The resulting body of work “Santa Baby” draws from religious and cultural iconography, personal and found photos, created and found text. As part of the show I am creating a digital advent calendar. Here hare here. This entry was posted in Advent Calendar, Installations, Nomas, Touched Collage. Bookmark the permalink.